**Disclosure: Complimentary product was received in order to bring you an accurate review and a giveaway. No other compensation was received. All opinions are 100% my own. 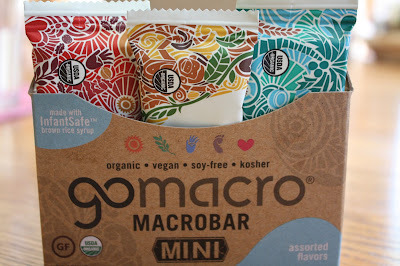 GoMacro Bars are produced by a family-owned company that focuses on supporting a natural, whole-food based lifestyle, environmental stewardship and concern for the welfare of all living beings. The bars are 100% vegan, USDA certified organic, certified Non-GMO, gluten free and kosher. They are made mainly from raw ingredients and the ingredients are easily decipherable! Often, this a challenge so definitely a plus! The story of GoMacro Bars is truly one of family. After the family matriarch Amelia was diagnosed with cancer, the family sought healthy diet options as Amelia began converting to a macrobiotic diet. The family had long emphasized eating wholesome, locally grown foods and the family owned a farm in Wisconsin where the family could grow their own food. Already on their way, their journey continued. 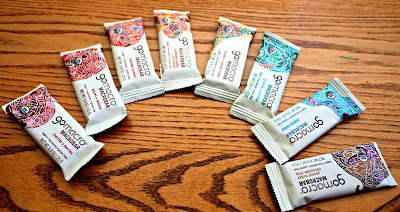 The development of GoMacro Bars grew from their exploration of healthy, natural foods. Eager to try GoMacro Bars as a snack alternative during our hikes, we brought them to visit a waterfall in Waterfall Glen near Lemont and Darien, Illinois! 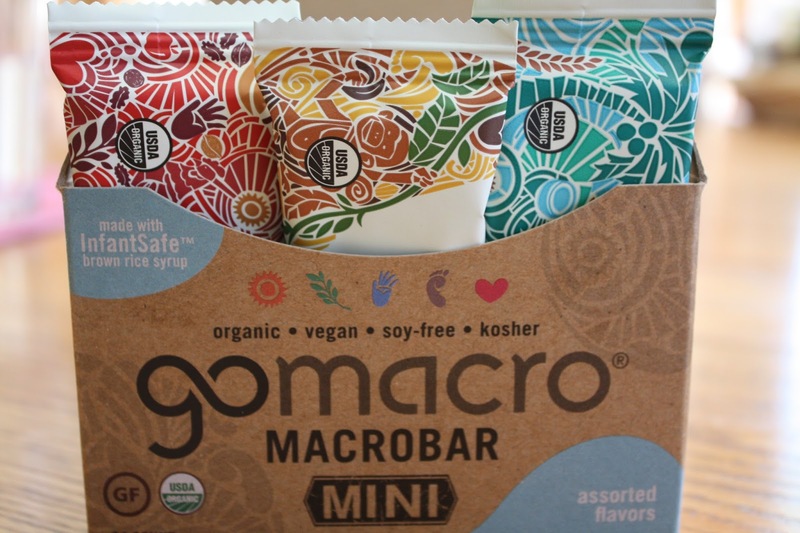 Surprisingly, GoMacro has been able to craft 11 different flavors--all into the trappings of compact bars that easily can be stowed in any shape or size of bag. One thing that I immediately noticed about GoMacro Bars is that if I got a little hungry on my hike, I didn't necessarily need an entire bar to satiate me. On various trips, I noticed I only needed half of a bar to hold me over until a meal. Truly the type of snack you need when traveling! GoMacro Bars are soft and chewy which may have a hand in why I feel so satiated after eating one! Peanut Butter and Chocolate Chip was an automatic favorite flavor as were Cherries + Berries, Cashew Caramel and Almond Butter + Carob. I really love that the fruit containing bars such as Cherries + Berries and Sesame Butter + Date have such noticeable chunks of fruit. 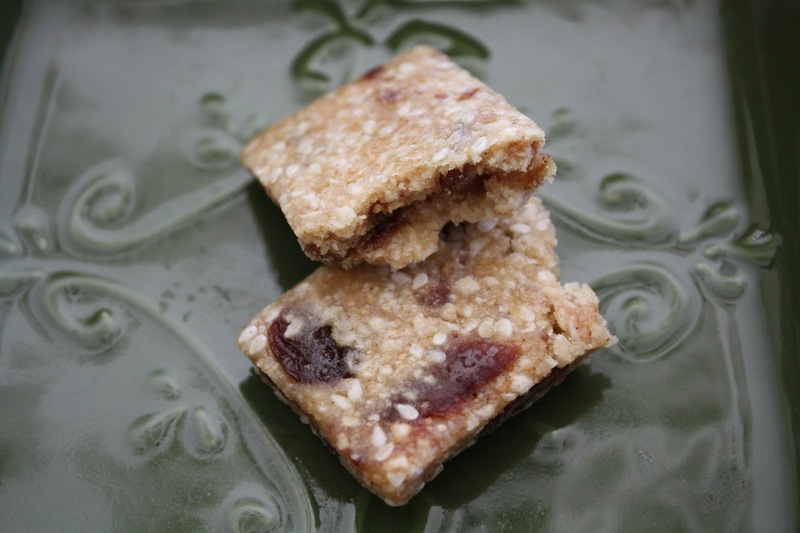 The quality ingredients do show and it is refreshing to find bars that are not dry. Cashew caramel sounds extra wonderful! The Banana Almond butter speaks my interest. However the Cashew Carmel also sounds amazing!! Apple and Walnut sounds wonderful! Of course, chocolate chips and peanut butter is high up on the yum sounding list too. The cashew butter bar sounds delicious. The Peanut Butter Chocolate Chip sounds really yummy! The Cashew Butter sounds the best to me! The Cashew Butter flavor sounds amazing! CASHEW CARAMEL! It's been so long since I've been able to eat caramel, so a reminiscent taste would be a dream! The Granola-Coconut one sounds right up my alley too! Actually, I'll just take all of the flavors. I don't choose favorites. I would love to try the Almond Butter + Carob. I'd love to try the cashew butter bar. Cherries + Berries sounds good. I'm eying up that almond butter/carob! Sounds delicious! Peanut Butter & Chocolate Chips would be the first bar for me to try! Yum! Sesame Butter + Date sounds amazing!! Peanut Butter + Chocolate Chip would be my favorite flavor. The Cherries and Berries flavor sounds delicious. They all sound good. I would definitely like Peanut Butter and Chocolate Chip! Sunflower Butter and Chocolate sounds good! I would like to try the Cashew Caramel bar. Apple and Walnut for me! I would be most excited to try the Cashew Butter! I am a huge cashew fan, so this one would be perfect for me! Banana + Almond Butter sounds amazzzing! Peanut butter choco chip would be my pick!